Posted: Mon May 06, 2013 6:08 pm Post subject: New web address!!! The name suggests that they now offer a phone service, rather than an unspecified multimedia service(TOS). Hear, hear. Here's what you are looking for. Unfortunately, this is just a summary and no specific details of the filings are shown. HOWEVER, there is one thing that is intimated that one would certainly expect: Former CEO Dan was accused of a material breach of the truth as to whether he and other employees of Magicjack had personally participated in these fora as early as 2008. Naturally, he denied this allegation, It was acknowledged by the arbiter the difficulty of substantiating this participation in the absence of sworn personal testimony, but I think we all know the real deal. Were this case decided by a more traditional hearing in a court of law, likely the outcome would have been different as everyone could have been deposed and sworn under oath. Not necessarily. I have seen people lying under oath in our state courts as boldly as Dan and getting away with it. Especially in non jury cases where you just need one crooked and incompetent judge- we have plenty of them. However, this panel's decision is totally ridiculous in multiple ways and just feeds my profound distrust of any arbitrage panels. The answer to the question of why MJ wanted this website to change its web address is pretty simple, actually. Now that the company is indisputably successful (see today's MagicJack News) it doesn't want others to use its name without formal permission or even *inadvertently* imply that they're formally affiliated with MJ. This happens regarding growing companies *very* frequently. So why would they buy a domain like "verizonphonenumber.com"
Who knows? I'm sure that they had an interesting reason for doing so when they originally acquired it, but that doesn't necessarily mean that they continue to have any use for it. 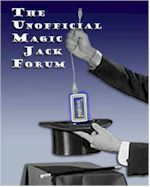 Well, it looks like that potting magic jack forum, unofficial magic jack support or anything else will bring you to magic jack's web site, even your own search history. You really have to start using the new URL. I think that a lot of new users will not find this site any more. Went to my bookmark for this site today and it took me to Dan's page with his daughter, who is now probably 20 something. Using a standard MagicJack, a MagicJack Plus, and Google Voice with the GVJackApp. I've been away from this site for quite awhile and it was indeed hard to find again much less try to figure out what happened. (Wish this thread was more prominently displayed.) I know a few of us around here also frequent DSL Reports. A sticky over there would be very helpful.